Alibaba banks over $30 billion dollars on China's Singles' Day. But is China's romance for shopping set to continue? "Singles' Day" was invented by Alibaba just 10 years ago. Today it is the BIGGEST shopping event in the world. Recording sales in excess of $30 billion, Singles' Day dwarfs takings made on similar deal shopping days, Black Friday (sales totalled $5 billion in 2017) and Cyber Monday ($6.6 billion in the same year), according to Business Insider. This is not just an online bargain day for keen shoppers but a cultural phenomenon - a "holiday" for those not in a relationship. It's sometimes known as "11/11" because not only does it take place on 11 November but the 1's represent being single and uncoupled... who knew! It's an anti-Valentines Day of sorts where you simply treat yourself. I'm all for it! But with China's economy slowing and international trade wars continuing (you know with who across the pond! ), it's not surprising that growth on last year has slowed. But, that said, there was still growth - 27% in fact! A figure any business would be happy with. And with over 40% of shoppers buying from international brands, including Apple, Nestle, Gap and Adidas, the trade war doesn't seem to be influencing which brands consumers are purchasing. Many economists talk about the rise of the Chinese middle class consumer and their continued desire to shop. Citing an OECD forecast, Alibaba's executive vice chairman, Joe Tsai, said in a company statement on Sunday that China’s middle class would almost triple by 2030, to 850 million, from 300 million. "Middle-class consumers have experienced significant real wage growth over the past decade, and they are looking for high-quality products to satisfy their discretionary spend and an increasingly sophisticated lifestyle”, Tsai said. And it's not just the Chinese market that wants in on the love. International brands like Nike offered Singles' Day discounts and offers across all of its platforms around the world. With the right investment (Alibaba has recently acquired Lazada, a Southeast Asian e-comm platform, and continues to invest in its tech) its wise to expect more records to be broken this time next year. Single or not, put the date in your diaries now: 11.11.19. 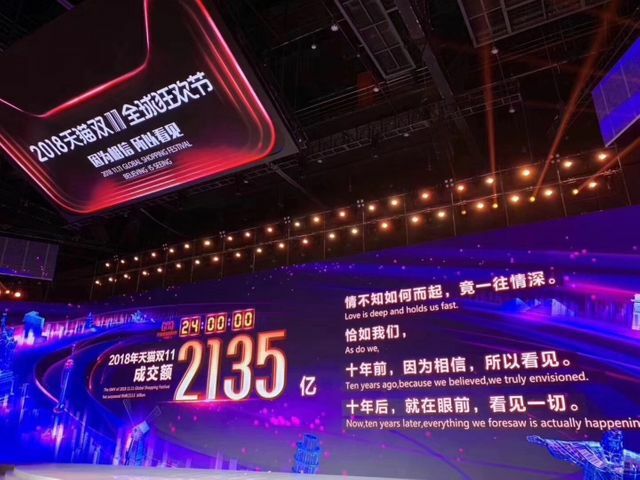 Marking the 10th anniversary, Alibaba reported the sales over the last 24 hours reached $30.8 billion (RMB 2,135 billion) in gross merchandise volume, up from last year’s $25.3 billion (RMB1, 682 billion) record. At the same time, it was the first time that delivery orders that were placed exceeded a stunning one billion. Has Dolce & Gabbana missed the mark with its latest campaign in China?